From Acrolinx 5.3, you can use Content Profiles to define your contexts. Context-specific guidelines are guidelines that only apply in certain contexts such as titles or lists. For example, suppose that you work with DITA and have specific style guidelines for writing tasks. You might want to ensure that authors always use the imperative when writing procedures. Similarly, you might decide that the imperative tense is optional when writing conceptual content. You can configure the "use imperative" guideline so that it only applies to text that is written as a command within a procedure. Before you start configuring your guidelines, you must define the contexts where you want your guidelines to apply. You must also define how Acrolinx should identify these contexts. For example, you would configure Acrolinx to treat any text that is enclosed within <cmd> tags as a command. You define your required contexts in a context definition file. A context definition file is an XML file with a simple schema . Once you have created a context definition file, you upload it to your Acrolinx server so that the server can read the contexts from your file. After you have defined the contexts that you require, you can start associating your guidelines with these contexts. You can enable or disable a guideline for a specific context. For example, if you have defined a "Title" context, you can configure a guideline so that it is enabled for the "Title" context only. Alternatively, you could configure a guideline so that it is enabled everywhere except the "Title" context. In this case, you would disable the guideline for the "Title" context. Select the radio button in the Contextual column. In the Select Contexts dialog box, configure the context-specific settings. Select whether you want to enable or disable the guideline in the selected contexts. In the Contexts field, select the contexts that are relevant for your chosen guideline. In the Select Contexts dialog box, click OK and on the Guidelines page, click Save . Your Acrolinx linguistic consultants should have already defined your context definitions and included them in your guidance package (formerly linguistic resources). However, you might want to create new context definitions or change the installed context definitions. You might update your context definitions if you start working with a new document type, or change the schema for your XML documents. Create a context definition file . Upload the context definition file . Add the contexts to your guidelines . Download the context definition file that you want to edit . Upload the new version of the file . Add any new contexts to the guidelines . You define your contexts by creating a context definition file or by editing an existing context definition file. 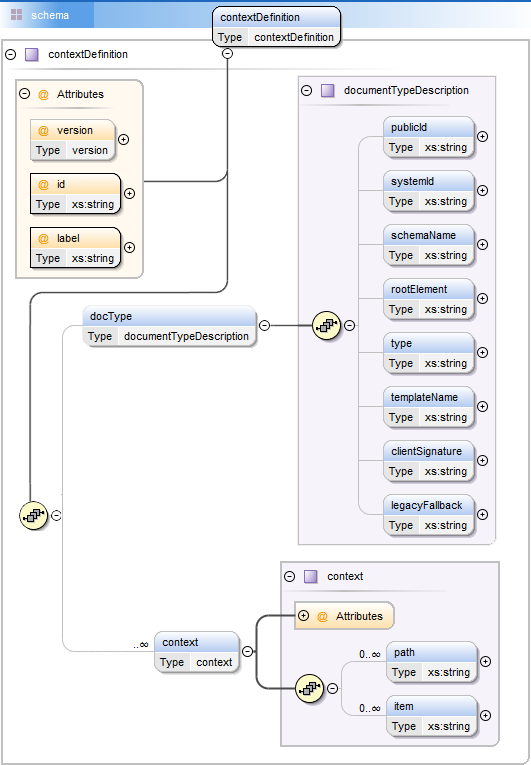 You add your contexts according to the XML schema for context definitions. If your organization uses Acrolinx to check several types of documents, you should have a context definition for each document type. A context definition is required for each document type so that context-sensitive guidelines work consistently for all users. For example, suppose that you have several title-specific style guidelines. These guidelines should apply regardless of whether the title is in a DITA Task, an HTML file, or a Word document. You would create a context definition for each document type and define how titles should look in each document type. To create or edit a context definition file, follow these steps. Create the basic XML structure. If you are editing a context definition file that you have downloaded , use the instructions in the next step to update it. [DOC_TYPE_NAME] Replace this placeholder with a unique identifier for the context definition. You can enter any value for this attribute, but it is recommended that you use the name of the document type. If the identifier is the document type name, it is easier for you to tell the difference between context definitions. For example, you could enter the name id="html" . The "id" attribute is case-insensitive. Suppose that you upload a file with the same identifier as an existing file, except that the identifier is written uppercase. The existing file will still be overwritten by the new file because the server ignores the case difference. [DASHBOARD_LABEL] Replace this placeholder with a name that makes it easy to identify the context definition in the Dashboard. This label appears in the Context Definitions list on the Context Definitions page. For example, you could enter the label label="Contexts for Standard HTML" . [DOC_TYPE_DEFINITION] Replace the placeholder with an identifier for your document type. For more information about how to define the document type, see the syntax reference for defining the document type . [CONTEXT_NAME] Replace the placeholder with a name that makes it easy to identify the context in the Dashboard. This name appears in the Select Contexts dialog box on the Guidelines page. For example, you could enter the name <context name="TITLES"> . [CONTEXT_DEFINITION] Replace the placeholder with a definition of the context as it appears in the document type. For example, you could have <item>Heading 1</item> . (Optional) Configure information about the locations of different Issues . This isn't essential for configuring a context definition, but you optionally configure how the sidebar displays information about the location of an issue. This provides extra information for writers about how to find the issue in a document. Save the file and upload it to the Acrolinx server . You usually download a context definition file so that you can edit it on your computer. You might also download a context definition file if you no longer have a copy of the file that you originally uploaded. Context definition files are read-only in the Dashboard. If you want to edit a context definition file, you download it to your computer first. For example, to add more contexts to an existing context definition, you must download the context definition file first. Once you have edited the file, you upload the new version. Before you download a context definition, ensure that any popup blockers are disabled in your web browser. Navigate to Guidance Settings > Upload Context Definitions . Select a context definition from the context definition list on the left. Click Download Context Definition File . Your context definition file must comply with the schema that is defined for context definition files. The schema for context definition files is stored in the server installation directory. If the server reports an XML error message when you upload a context definition file, you should probably check your file against this schema. The following diagram illustrates how a context definition file should be structured. contextDefinition This element is the root element and must have the attributes id and label . The value for the id attribute must be a unique identifier for the file. The value for the label attribute must be the name of the context definition as it appears in the Dashboard. docType This element defines the document type that the context definition applies to. This element must appear before the context element and should be used once only. It must contain at least one child element which can be at least one of several identifier types . context This element must appear after the doctype element. This element can appear an unlimited number of times. It must contain at least one child element which can be one or both of the elements path and item . When you start a check, Acrolinx tries to ensure that your context-sensitive guidelines work correctly with the type of document that you are checking. After the Acrolinx server receives the check request, Acrolinx searches for the context definition that best matches your document type. Acrolinx compares the docType information in the context definition file with the information that the Acrolinx plug-in provides about the document type. After Acrolinx has done this comparison, Acrolinx selects the context definition with the most matching information. If there is no matching context definition, Acrolinx makes all context definitions available for checking. This approach means that some of your context-sensitive guidelines can still work correctly, even though no context definitions fully match your document type. In the previous example, there are two criteria that have to match: the public ID and the client signature. Suppose, that the client signature is for the XMetaL plug-in. This configuration instructs Acrolinx to apply the context definition only when you check a DITA Concept with XMetaL. If you check the same file with another plug-in, the public ID would be the same, but client signature would be different to the signature in your context definition. In this case, the context definition wouldn’t be considered a "complete match" and would not apply. However, suppose that there are no other matching context definitions available. In this case, Acrolinx would apply the context definition from the previous example along with any other context definitions that you have created. To summarize, if there are no matches, Acrolinx applies all context definitions that are available. When you see how complex the matching can get, you might conclude that it simpler to define one piece of document type information. When you keep the matching simple, it is easier to troubleshoot why some context definition guidelines do not work as expected. In general, try to use one criterion such as the public ID when defining the document type to match. You can also use wildcards to match part of any document type field. This feature can be useful for public IDs. For example, if you want the context definition to apply to all DITA files, you can enter the following line in the doctype block. Restriction: Currently, plug-ins with the version 4.0 or later do not send any information about the document type when checking profiles are disabled. The plug-ins only send the client signature. If you do not use checking profiles, you must add the client signature as a criterion in your document type criteria. If you do have sophisticated guidelines for how context definitions should be match with your document types, consult to your Acrolinx project consultant on how to best structure your context definition files. Before you start to define your contexts, you must define the type of document that the contexts apply to. Each context definition file can apply to one document type only. You use the docType element to configure an identifier for your document type. There are several types of identifier elements available. You should select an identifier type based on the version of the plug-in that your users check with. Newer plug-in versions provide the Acrolinx server with more information about the checked document that older versions. The following table describes all identifiers that you can use to assign context definitions to document types. The table also contains information on the syntax for assigning extraction settings to these document types. Extraction settings are described more detail in the topic "Managing Extraction Settings" . You might use this identifier for simple XML documents that don’t have a document type definition or schema. You might use this identifier for customized Acrolinx integrations such as CMS integrations that don’t send a plug-in short name. To define each context, you give the context a name and define how Acrolinx should identify the context. You define how to identify the contexts by listing the different names that a context could have in your document type. For example, suppose that you are defining the "title" context for Word documents. You might consider a title to be any text that has a style with the word "Title" or "Heading" in the style name. You might define all possible style names that Acrolinx should treat as a title. You can also use wildcards in the name to match part of a style name. If you work with XML documents, you can use XPath expressions to pinpoint the exact location of a context. If you want to be sure that you are using the correct names in your context definition, you can check a sample document and review the check request properties. The contextinfo section contains the names of all the contexts that Acrolinx found in the document. To get the check request properties, first enable the " Capture Server Workload " feature and run a check. The check request properties are saved in the server output directory. You can use the item element to match the name of an element or style regardless of where it appears in the document. You can also enter basic regular expressions such as wildcards to match part of a name. However, character classes such as "\s" or "\d" don’t work. The content of the item element is case-sensitive. The following example shows how you would define a title context for Word documents that include styles with "Title" or "Heading" in the style name. The following example shows how you might define a title context for HTML documents. In the previous example, only header levels 1 and 2 are defined as titles, but you can also add any number of header levels. The following example shows how you would define a title context for DITA tasks. You can use the path element to define a specific location in the XML or HTML document structure as a context. You can find out more about the syntax for XPath expressions on the w3 schools website. The following exaple shows how you might use XPath to define the title context for HTML documents by selecting a specific class. The following example shows how you might use XPath to define the title context for DITA Concepts. In this example, Acrolinx only treats text as a title when it appears in a concept or section title. A title element can appear in other parts of a DITA document. However, in the previous example, title-specific guidelines would not apply to figure titles or table titles. The previous context definition applies to concept and section titles only. You can also use XPath to exclude certain contexts when they appear in specific elements. The following example shows how you might use XPath to define the paragraph context for <p> elements except when they appear within lists or tables. You cannot enter spaces or hyphens within the item element. If you want to add a Microsoft Word style that contains a space such as "List Paragraph", add a wildcard character instead of the space. The item element should resemble the following example: <item>List.Paragraph</item> . If you have a context that contains a dot such as text.mainbody , use the path element to isolate the context. The following example shows how you would use the path element to ensure that you select the correct context. Once you have created or edited a context definition file, you upload it to the Acrolinx server. You upload a context definition file so that you can start associating your style or grammar guidelines with the contexts that you have defined. When you upload the file, Acrolinx reads the contexts from the XML and makes the contexts available for you to select in the Dashboard. Navigate to Guidance Settings > Upload Context Definitions and click Upload Context Definition File . Click Browse , select the file that you want to upload, and click Upload . After the upload has completed, the name of the context definition appears in the list of available context definitions. This name is taken from the "label" attribute in the context definition file. The contents of the file preview section is updated to show the contents of the file you uploaded. You can use this preview to double check that your context definitions are correct. This extra information helps your writers figure out the location of the issue. You add this information by configuring a flag location definition. Open a context definition file and add the following code. [TYPE_NAME] Replace this placeholder with a unique identifier for the flag location definition. You can enter any value for this attribute, but it should be something that makes it easy for you to tell the difference between location definitions. For example, you could enter the name type="headingLocation" for headings. [XPATH] Replace this placeholder with an XPath expression that defines the specific location of the elements in the XML or HTML document structure. You can find out more about the syntax for XPath expressions on the w3 schools website. [LANG_ID] and [LOCATION_NAME] Replace the placeholder [LANG_ID] with a two-letter abbreviation for the localization language and replace [LOCATION_NAME] with the name of the location.